Living in the country has it’s pros and cons. Most of the time, the pros outweigh the cons, but when it comes to snakes, it makes me wonder. I don’t know if it’s because it’s been warmer than usual, earlier than usual or because they’re looking for water, but I’ve seen more snakes in the past week than I have in the past year. As a matter of fact, I stepped on one today when coming back from the garden. I don’t remember ever making a sound like that before. As long as I know they’re not the poisonous variety, snakes are beneficial so I let them be. Snakes can also be beautiful (in their own way.) Snakeskin shoes are hot. No lie. Some people like snakeskin boots. I’m not into them. 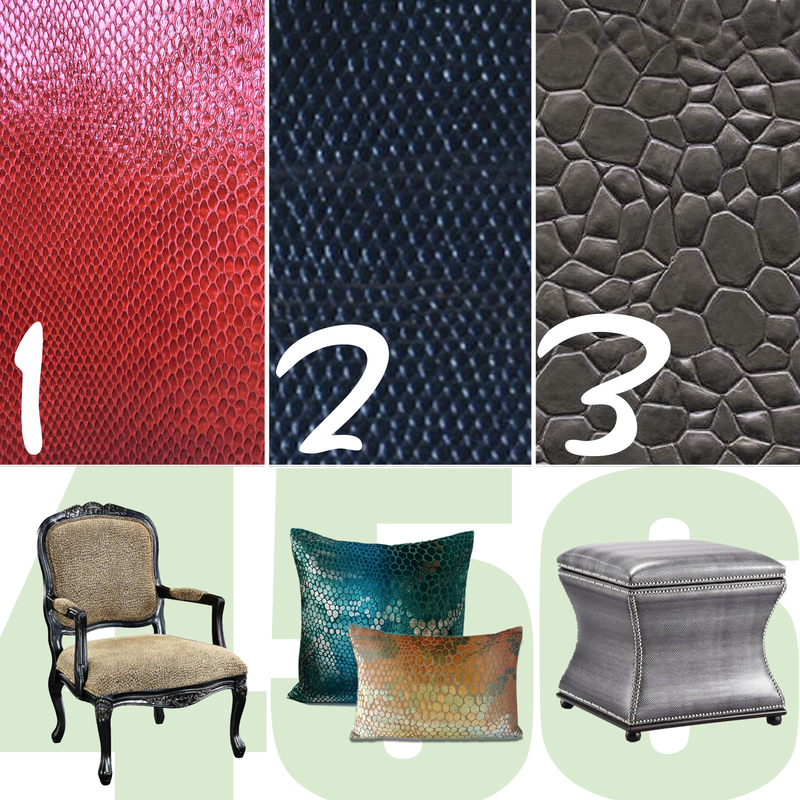 But there are also ways to bring the smooth, undulating scales of snakeskin or other reptile prints into the home in a beautiful way. One way to keep snakeskin fresh and non-threatening is by introducing it in bold, vibrant colors. My favorites: turquoise and metallic silver! So how do you bring these fabulous fabrics into the home? Accent pieces are great for the reptilian print. 4. The Ellis chair from LampsPlus.com has a beige reptile print in a soft chenille fabric. 5. Kevin O’Brien pillows are incredible. Really, really incredible. These iridescent burn-out velvet pillows are gorgeous in bold, multi-color snakeskin. Any of the above are welcome any time around or in my home. I cannot say the same about their inspiration. Interested in any of the featured fabrics or products? Contact Gina McMurtrey Interiors, LLC today for pricing and availability and we’ll ship it directly to your home! For your next remodeling or redecorating project, consider eDECORATING or schedule an in-home consultation today! You have the freedom to create a beautiful home!